Taiwanese avant-garde fashion designer Johan Ku, who debuted on the international fashion stage in New York and studied in London, decided to build his label from Asia, designing his collections in Taiwan and launching them in Tokyo. His haute couture and ready-to-wear lines are now available at his first flagship store in Taipei. 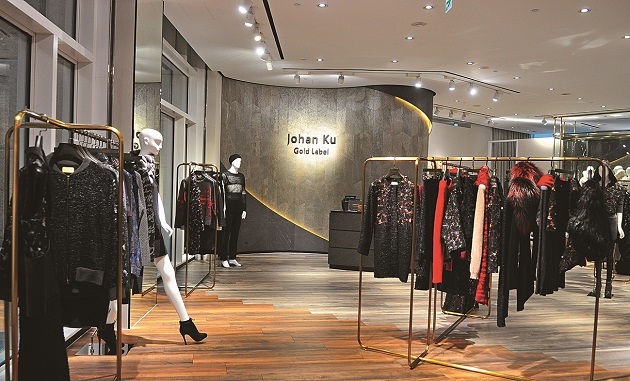 Three months ago, the first Johan Ku Gold Label store opened on the second floor of the Bellavita luxury mall in Taipei’s posh Xinyi District. The most eye-catching features at the new boutique are not the colorful pieces of Ku's latest collection, but two stark white manikins in the shopfront window, clad in chunky, three-dimensional knitted outfits in wool white. The pieces made from textured knitted and crocheted wool tops belong to Ku’s famous Emotional Sculpture collection. The collection won Ku Gen Art's Design Vision Award for Avant Garde in New York in December of 2009, catapulting the budding designer to instant fame. In hindsight, the year 2009 had great significance for Taiwan's fashion industry. At the beginning of the year, the first lady of the United States, Michelle Obama, made a stunning appearance at her first inaugural ball, wearing a floor-length white chiffon gown by relatively unknown Taiwan-born fashion designer Jason Wu. Obama’s patronage catapulted the young Wu, who studied fashion in New York, to stardom in the fashion world. At the end of the year, Ku made fashion news headlines as well when he declared at the Gen Art award ceremony in New York, "I come from Taiwan." 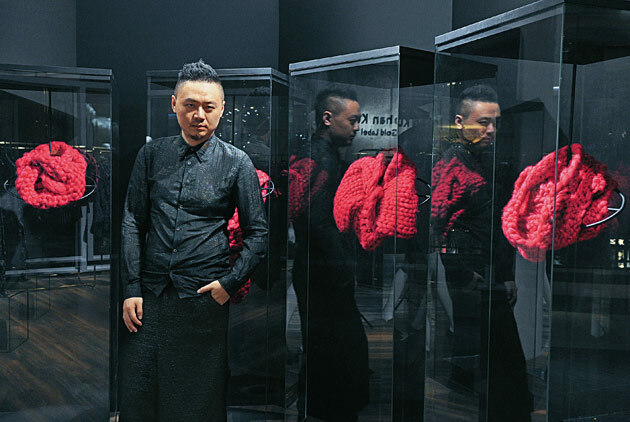 With his statement, the “avant-garde fashion designer” struck a chord with young people in Taiwan. Ku's success showed that there was a stage for young Taiwanese talent, that international awards were not out of their reach. The silhouette of Taiwan began to make appearances at the four major fashion weeks in New York, London, Milan and Paris. In the six years since, however, Ku, who studied fashion at the prestigious London art and design college Central Saint Martins, has turned his back on the glamorous European fashion metropolises, choosing the Tokyo Fashion Week as his stage instead. In October, Ku launched his couture collection for the eighth time on the catwalks of Tokyo. The 36-year-old Ku has knitted together a different scenario for his label, blending design talent and business acumen. “The fashion industry is a mind game that is not just artistic but also strategic. For which fashion week will I be strong enough? At which trade show will I find buyers? Whom can I beat, and whom can't I beat before I can slowly build my label? These are things you can't just decide light-heartedly," notes Ku in an interview with CommonWealth Magazine at his new flagship store in Taipei, ten days before the launch of his latest collection at the Tokyo Fashion Week. “I did not even invest in this flagship store; I didn’t open it. My general agent for Taiwan made the investment. I have always positioned myself as a design company. Since I have little understanding of retail channels, I prefer to keep things simple; I don't want to do things I am not good at," remarks Ku in elaborating on his business philosophy. Ku’s humble upbringing might be a reason for his very down-to-earth attitude. Having lost his father at the tender age of three, Ku’s widowed mother relied on cleaning jobs and government subsidies for low-income families to raise her son. The designer founded his label Johan Ku in 2010 upon his return from Britain because he felt that his home country offered the most resources to fall back on. Why didn’t he apply for participation in the London fashion week right after earning his masters degree? “I noticed that many buyers would stay in New York in the week following the New York Fashion Week to attend trade shows and tour show rooms. Buyers would easily skip the London Fashion Week, so I decided against London," Ku says. In March of 2011, Ku began to present the collections of his haute couture line Johan Ku Gold Label at the Tokyo Fashion Week. He used the event as a stage for communicating his label to the international fashion world. However, since he was not satisfied with the orders generated there, Ku decided to tackle the American market, where he had once shone with the prestigious Gen Art award. Ku has shown exceptional flexibility when it comes to adjusting his label to different customer groups and market segments. In early 2012, Ku began to participate in large apparel trade shows in New York such as Fashion Coterie and DNA to test the waters and get a feel for the price segments. Then he decided to drop his Pink Label and Grey Label collections, which had not proven a resounding success, to launch his new 01 Johan Ku ready-to-wear line for the modern businesswoman. The new collection, which Ku began to show at the major New York trade shows from 2013, immediately proved a hit with industry buyers, partly because it had a clear focus. Ku's pieces were designed for American businesswomen above the age of 30 with a monthly salary of more than US$3,000. Single garments were priced between US$200 and US$500 and made from premium fabrics such as cashmere. “From then on I completely separated my haute couture and ready-to-wear collections, drawing a clear line. The first was taking the creative path to build the brand image, while the latter was aiming for the mass market," notes Ku. Under this business model, Ku was able to generate stable revenue. Meanwhile, the American market accounts for 70 percent of sales, while the other 30 percent comes from Asian countries. Five years ago, Ku published his memoir Design Against All Odds, in which he describes his ardent road from freelance graphic designer to avant-garde fashion star. While nothing, neither the adverse circumstances of his childhood nor the commercial challenges of the highly competitive fashion industry, could break his determination, the death of his mother from cancer three years ago dealt him the most serious blow of his life. “I toured all big hospitals with my mother’s medical records but got the same answer everywhere. All other things you can analyze rationally, but regarding this issue you are completely helpless," notes Ku in summing up his deep frustration in the face of his mother’s terminal diagnosis. Ku was depressed for a long time and even pulled out of the Tokyo Fashion Week for a season. Last April, Ku’s sixth collection, again presented at the Tokyo Fashion Week, made it to the cover of Women’s Wear Daily, one of the most authoritative fashion industry magazines in the United States. “This was great encouragement for us. I kept it up for six collections and made it to the cover of a global mainstream fashion medium. If I had worked in London with the same resources, this would not have happened; the competition there is just too fierce,” says Ku. Five years after launching his own fashion label, Johan Ku opened his label’s first flagship store in the Bellavita luxury mall in Taipei. In the meantime, Ku's small design studio has grown into a company with ten employees. His creations are sold in more than 30 luxury boutiques across the United States. Yet Ku still personally attends every trade show on the East Coast in New York or in Las Vegas on the West Coast, looking after both design and sales. A fashion industry elder once advised him to attend every single trade show if possible. "It is because you can learn the most business acumen from the buyers, such as what your customers are like, why they pick this and not that, what effect a different material would make, and so on,” explains Ku. He describes the design process as being happily in love, whereas building a fashion label is more like getting married, because a great many real problems have to be considered. Over time, Ku has become more mature, so that the unyielding stubbornness behind his self-confidence has mellowed a bit. Ku is no longer the stiff and tense youngster who wants to prove something. Having found a sustainable, stable strategy, he can lean back and take things easy, as he is finally in full control of his own creative design journey.